Native to Australia, the flightless Emu weighs up to 120 pounds and stands 6 feet tall. An ancient species, unchanged for over 20 million years. Used by the aboriginal peoples of Australia for thousands of years and is still an integral part of their daily life and spirituality. Is not now and has never been an endangered or threatened species. Millions still roam wild in Australia. 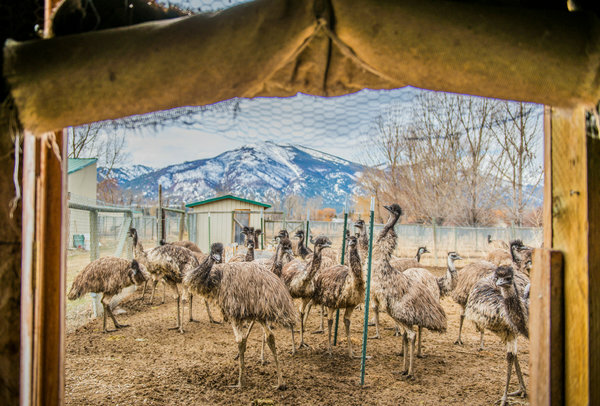 Unlike most animal agriculture, Emus do not cause soil or water runoff pollution. Their presence actually improves the land. Will not thrive or reproduce if managed inhumanely. Millions are now raised as poultry in the U.S. and the world for meat, hides, oil (which is made from its fat), eggs, manure, and feathers. At the dawn of time, according to Australian aboriginal mythology, the world was shrouded in darkness, for this was a time prior to the creation of the sun, and our skies carried only the light of the stars and the moon. Under this dim light, two of earth's creatures, the emu and the brolga, began to argue over the future of the eggs that they both had nested upon. The birds believed that their own future chicks were of a higher quality to the others. Finally, overcome with anger, the brolga hurled herself at the emu's nest, wrenching one of the eggs away from the distraughtful father emu. The brolga overcome with emotion, hurled the emu egg far into the night. In a mighty eruption the shell of the egg shattered high in the sky. The yolk of the egg burst forth in an eruption of flame, shattering against piles of wood gathered by the sky people, and the sun was created. In testimony to the beauty that they had seen from this explosion, the sky people gather and light a pile of dry wood upon hearing the morning laughter of the kookaburra. 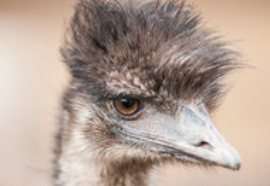 To the emu farmers of Australia, this tale of creation symbolizes the birth of the emu industry and the pioneering of the emu industry by the aboriginal people of Australia.